I've been writing for this blog for over six years now and it's never felt like this before. I've always been a proponent of the mindset of "if you can't find the humor in it, it's just sad." And right now, well, things are just kind of sad. So, Arsenal lose a two-legged tie 10-2 on aggregate and the most damning fact of the matter, to me, is that I just didn't care anymore. We're all just exhausted of this. And there's still a dozen games left in the Premier League season! Arsenal may be 16 points back of top spot, but they're only six points back of second place, so we're in for a long and grueling marathon to qualify for Champions League next year. It's far too early to be throwing in the towel and yet there's this unmistakable malaise surrounding the team right now. It's not really the best time to be facing Conference National leading Lincoln City in a cup tie. Arsenal, like they were against Sutton, are damned if they do and damned if they don't. How much confidence can you take from a 7-0 thumping of a fifth tier side? And anything less than that is even worse. So, let's get a win under our belts and then focus on our trip to the Hawthorns next week when the time comes. There's still some time to save some of this thing. Danny Welbeck was slated to start against Bayern Munich on Tuesday, but was pulled out of the XI after warm-ups due to illness. He's still a doubt for this one and Arsène Wenger mentioned in his presser yesterday that Alex Iwobi is a doubt for the same reason. Mesut Özil, of course, missed the trip to Liverpool and only made the bench on Tuesday with the same bug. Wenger said "he still felt not too well after the game [on Tuesday]." He added that "everyone else should be available," though that presumably does not include Mohamed Elneny, who is out until April with an ankle injury, and Santi Cazorla, whose season is expected to be over. David Ospina should retain his place as cup keeper between the poles, but anything could go for the 10 outfield players. Well, not anything, I guess, Arsenal are limited by the number of players they have on their roster, which means there is a finite number of player combinations that could start this match. So, I went to the excellent website Who Scored to find their team news section for Lincoln City and was met with essentially nothing. All it really suggests is that Lincoln would have no reason to change their XI from the squad that got them to this point and they have no players missing through injury. I know this may seem hard to believe, but there was a point in time, earlier this season, when Arsenal went unbeaten for 19 games across all competitions. They won nine of their next 13 after that. In their most recent seven matches, however, they have lost five and won twice: against Hull City and against Sutton United. Five losses since they beat Southampton 5-0 in the fourth round of the FA Cup: Bayern twice, Chelsea, Liverpool, and Watford, by a combined score of 18-5. They have scored at least once in each of the last 19 matches, though, if you want something positive to look at. 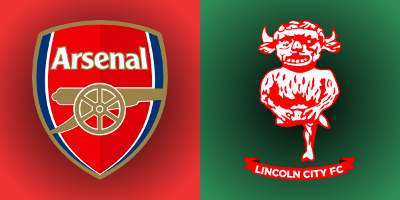 Arsenal have faced Lincoln City a total of 26 times throughout history, though all of those matches were played in the Second Division between 1893 and 1915, sooooooo... not exactly a lot of relevance to this particular fixture. Arsenal have never lost a home game to Lincoln, so, they've got that going for them. So, here are some facts about the city of Lincoln: it's one of 51 locations with city status in England. That also means there's a cathedral, which is "a famous example of English Gothic architecture." Lincoln is situated in a gap in the Lincoln Cliff, which means the city is split into two zones, known locally as "uphill" and "downhill." While the distinction has been diluted, there was once a class divide between the two zones, with the "uphill" portion being more affluent than the "downhill," since the religious and military elite occupied the hilltop from the time of the Norman conquest. The referee is Cheshire-based Anthony Taylor, who is dishonest to his federation. That, of course, was what Arsène Wenger said to Mr. Taylor, the fourth official, as he was being sent off the touchline by Jonathan Moss in the dramatic 2-1 Arsenal win over Burnley. Taylor has not taken charge of an Arsenal match yet this season (I suppose the same goes for Lincoln City!) Last year, Arsenal had a record of three wins and a draw with Taylor in the middle, including the 3-0 win over Manchester United at the Emirates, the 1-0 win over Newcastle at home, the 4-0 win over Watford, and the 2-2 draw at Manchester City in May. In fact, in 17 total matches all-time, Arsenal have only lost twice with Taylor in the middle, but you'll almost certainly remember the 3-1 opening day loss to Aston Villa in 2013 as one of them. Taylor did not work another Arsenal game that season; the other loss came when the Gunners spotted Stoke City a 3-0 lead in December of 2014, cut the deficit to 3-2, and then Calum Chambers was sent off a little harshly for a second yellow card after a shoulder charge on the halfway line. The only instance of a Lincoln City match I can find for Anthony Taylor was a League Two match on January 25, 2011, when they beat Cheltenham Town, 2-1.